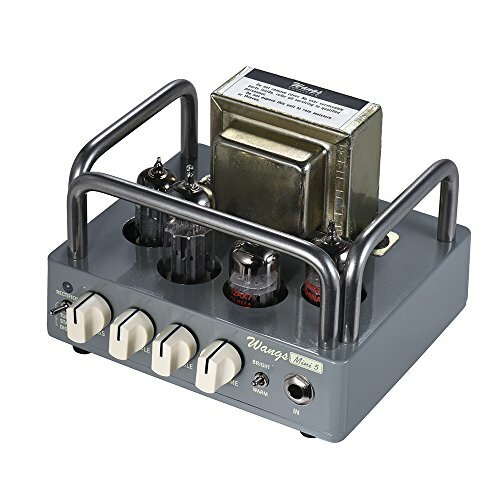 Mini 5 is an excellent little tube amplifier that delivers classic tube tones in a tiny package. With 5 watt power output, it is a perfect solution for bedroom jamming, studio projects and general rockin. 5 Watt all tube amp head with 2 rectifier modes(TUBE & DIODES) and 8ohm/16ohm speaker output jacks, very powerful. Equipped with pre-amp tubes(1.5 * 12AX7/ECC83), power amp tubes (0.5 * 12AX7/ECC83 & 1 * 12BH7) and rectifier tube(1 * 6Z4). Single channel, with VOLUME, BASS, MIDDLE, TREBLE control knobs and BRIGHT/WARM tone toggle switch. German made W.I.M.A MKP capacitors, precision high frequency metal foil resistors. Compact size and full metal shell, portable and durable.